my life as a brownie. : laughter and music. This weekend I stayed at home. Yes. I did NOT go out once, except to hand in one of my assignments at school. What got me through this weekend was first, my cousin Devika, who would Skype with me and make me laugh till my tum-tum would hurt and my music-- the Weeknd and Buddha Bar... yes Buddha Bar-- love them! I'll post a video of the two songs I repeated this entire weekend. Oh and please take the time to look at the beautiful images posted on the song Secret Love- Buddha Bar. Absolutely stunning. 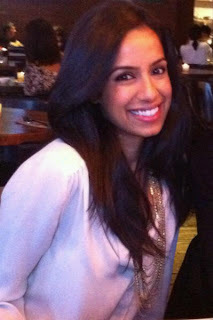 Oh and I thought I would post a picture of my beautiful cousin Devika who never fails to make me smile. Devika "cousins by blood, best friends since birth"